Karaoke evenings are meant to unleash the bathroom singer in you and sway to the tunes of your loved songs. Since technology is advancing with time, there have been changes in the way karaoke is played now. Karaoke mixers are essential part of any karaoke activity. They are electronic devices used to mix audio inputs coming from different sources like that of microphone, instruments and other players. It is something similar to what a DJ uses and is a professional equipment to make the music and the overall experience better. Mixers are packed with functions and can change the dynamics of a song. They are also used to electronically change the volume, bass, sharpness and other sound related features that you might want to alter. Once the modifications have been made, an amplifier connected to the speaker amplifies the output signal for loud speaker output. With growing number of karaoke booths in and around the city, the demand for karaoke mixers has also been high. There are many of them out in the market and it is important to know the details to choose the right one for you. Here is a list of the best karaoke amplifier mixers. Everything in today’s date can be done on a computer or perhaps a laptop given its portability. This is why it is advisable that the karaoke sound mixer you choose is equipped with a USB port for accessibility. The Alesis Multimix boxes four input channels and also gives you the liberty to record live sound directly to your computer. It is ideal for an average home user who likes things at the ease of their computer. In the microphone department, there are two channels for the input each with a different specification of either balanced or TS input. It should be noted that only one of the ports can be used at a time. Gain, EQ, FX and volume can be adjusted through these channels. It also features some classy effects in the background that will enhance your experience at a karaoke night. There is stereo input on the mixer. This is where you would input the music from a CD or from an external player. There are left and right channel ports which also offers EQ, FX and volume adjustments capabilities. There is also a headphone jack (3.5 mm) for giving an audio input directly from a phone or an mp3 player. When it comes to output ports, the left and right unbalanced channels could be connected to an amplifier and you are good to go with your best karaoke songs. Choosing any electronic product always comes down to selecting the right one according to your needs. Behringer XENYX502 5-Channel Mixer is meant for tiny karaoke booths or home parties as it is quite inexpensive and doesn’t include advanced features which professional karaoke mixer amps have. This isn’t a compromise, but the key is to prioritise your usage. If you are looking for something that fits good with the condenser mics and is your highest priority regardless of any other feature, this might be your best bet. It has a feature called phantom power, which gives a boost to support condenser mics in its full glory. It has stereo input channels for distinguished and clear sound input but has a mono channel for mic. Mono channel refers to just one input port available for microphone connection. However, it does have knobs for adjusting EQ, FX and volume of the microphone which is quite rare to see on a budget friendly device. There is stereo unbalanced output through a left and a right channel along with a volume control knob. One of its pros also includes a sturdy built and an ergonomic design for durability. Mackie is one of the leading companies in this industry and with this product out in the market, they don’t fail to maintain their standards. 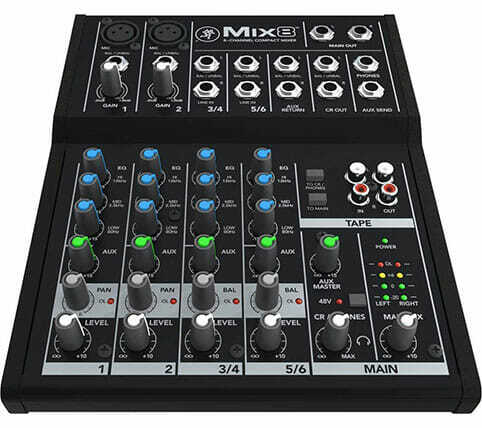 The Mackie Mix Series Mix8 8-Channel Mixer is sturdy with a rigid built and packs in most essential features. Starting with the microphone sector, it has dual channels like most other advanced karaoke mixer amplifiers. Simple controls like gain, EQ, FX and volume can be controlled comfortably. The highlight of this sound mixer is its output channels. It has two outputs which can function as stereo or mono according to your needs. An exceptional feature of this sound mixer lies in the aux return channels. The aux outputs can be used to give output to your parallel devices or it can also be used to add more speakers in balanced or unbalanced stages. One thing which is quite weird about this is that there is no power switch on the device and plug needs to be removed to switch it off which can get quite abrupt. If you are getting into party mood after a long week, then this mixer is perfection at its best. Yamaha has been a pioneer in the music industry for a while and Yamaha MG06X offers all top-notch features with a dual input for mics including phantom power which is commonly used for condenser mics. The enlightening part is that the phantom power can be switched between the two ports. All adjustment knobs are present on the mixer like EQ and volume adjustment. It packs in some great features for reducing noise in the input audio like PAD and HPF switches which can be used to attenuate undesired frequencies and attain the required loudness from the mic. There are other stereo inputs present too which can be used to plug in other parallel devices like a CD player or a computer. However, the stereo can also be changed to mono input if just one port is used. Coming to the outputs, this model has flagship like features that can make your party rock like none other. Coming to what makes it different from others is the effect processor which comes in-built with it. There are effects like Delay and Reverb which can be activated with push of a button. The effects are sent to mono channels which have a button to turn it off or on. Given the features, it sure is costlier than the others but offers what it charges for. This Behringer mixer finds its place on the list due to its very compact size and stupendous features within a tiny built package. Its dimensions are smaller than its competitors but offers more features than most of them. In the era of disappearing smartphone bezels, karaoke mixers need to get small too. It doesn’t however compromise on the power delivery. You can either choose from a 2×800 Watt stereo or a 1600 Watt bridged Mono sound. It does include the phantom power output for condenser mics which is a crucial part. None of the channels have been compromised either to keep a compact size and CD/Tape and RCA inputs are available as well to make sure you can use a disc or other external devices along with it. Since, Behringer believes in flagship quality, special effects are bound to be present. Thus, there are two studio grade 24-bit Multi Fx Processors which provide the much-required effects in the sound. Surprisingly, it gives the option of over 100 pre-set digital effects which is a high amount including reverb, delay and chorus. It also comes packed with a voice cancellation feature which will remove the lead vocals from a song to create karaoke music for the night. It performs really well but in some cases might fail to do so. It offers high quality sound outputs which can be connected to Speakon powered output speakers. This is a great product but all of it does at a price. If your budget suits the range, this is one of the best options to go for. This bluetooth karaoke mixer is one of the best options in the market. However, this is more suited for a professional purpose like that of a reputed karaoke bar or a club. It has wireless connectivity like Bluetooth and WIFI which is rare to see in Karaoke electronic devices. It can be controlled with almost any Bluetooth enabled device including your smartphone or a Bluetooth remote. You can either go for the traditional method of using CDs to play your karaoke music or stream wirelessly via your phone or mp3 player. This amplifier also tags along FM and AM with it, so if you are hoping to sing along with your favourite radio station, its no big deal. This will give you a complete overview of “DJing” to your favourite song as it also lets you control the bass, treble and echo of the sound to the desired level. There is one extremely special feature of the product that comes in very handy. It is the LCD display on the amplifier. It has two microphone inputs and four speaker outputs. Since you now have an LCD screen to digitally monitor the volume and other specification controls, you can adjust the volume of both microphones to the same level for a balanced duet. Syncing your speakers, if they don’t automatically sync is now very easy with the PYLE PT265BT Bluetooth 200W. Also, it has a built-in amplifier which makes sure everyone is heard loud and clear. This is a very professional device hence the high price is justified with top of its class features. Choosing the best karaoke mixer in the market can be quite tricky. However, Voco Pro DA-100 Professional is a worthy piece of equipment to own for a karaoke fanatic. this karaoke mixer can be used by professionals and beginners, whether in a club or at home as it does justice to the price you pay. It’s easy installation and usage makes it user friendly which is why it has a lot of positive feedback from the customers. One of the most efficient features of this karaoke mixer is its ability to accommodate three microphones at one time. The buck doesn’t here. You also have the feature to professionally control the delay and repeat of each mic separately thanks to its digital echo control. It also packs in individual volume controls along with each microphone port. It has editing and effects too which includes bass, treble and sharpness of sound which is a nice addition. Every device has one special feature which makes it stand out from the crowd and for this mixer, it is the voice partner feature that marks its uniqueness. Voice cancellation is quite common in most karaoke mixers where the lead vocal is removed from the song; however, this mixer has the feature to add lead vocal assistance to help those who are finding it difficult to sing along. Another benefit of this device is its compactness. It is a lightweight device weighing less than 7 lbs which makes it portable. Since it can be used at clubs and at home, it wouldn’t be tough carrying it around either given its compact ergonomics and light weight. While the last product allowed professionals and beginners to use the product at the same time, the Hisonic Dual Channel MA-3800K is meant for professionals and a much larger crowd. Its 760 Watt power is able to make sure that it entertains a large crowd and provides ample power output. This one also is accompanied by three audio input ports which means three different people can sing together at a time. Each microphone has its own feature control like volume and treble knobs which give an immersive sound experience. This machine is ideal for professionals and DJs and is not ideal for home usage. If the priority is running a club with a large crowd, this would be one of the best choices. It has a nice flat design which makes it easy to handle. Coming to what differentiates it from the rest, it has voice control which lets you control the features by speaking out commands. The voice commands work like a charm and you don’t have to worry about moving while singing and can change settings by using your voice at your convenience. If you wish for durability, this should be your ultimate choice. The machine is bulky and weighs around 30 lbs which means, once settled you don’t want it to be moving around the place. It also comes with a one-year warranty and a flat 30-year satisfaction guarantee which is enough to convince you to buy it. This is definitely a long-term investment and because it is meant for professionals, it doesn’t come at a very affordable price. You need to cash out extra bucks but if this is in your budget, there is nothing better than this. For those who don’t wish to carry heavy objects, there is no better choice than this one. The Fifine digital audio sound echo mixer weighs just one pound which means you can carry it around in your backpack without a speck of hesitation. It also comes at a very budget friendly price so is an amazing choice for those who like to maintain a tight budget. Even though it lies the budget friendly segment, it does not cut out on any important features. You can use two microphones with the product and there is a very convenient echo indicator beside each to help you control the level and get the desired sound. Another great feature is its credibility to reduce noise through different mic channels so you can sing along with a friend all night long. This is an HDMI karaoke mixer which means it lets you plug the mixer into your TV and start singing to the best karaoke songs on your list. If you think you have been singing great lately and wish to make an album, this mixer gives you the option to record your singing and saving your pockets from having to vent out on a studio t record an album. However, the quality is not exceptional, it sure will satisfy your needs. Also, the mixer itself costs hardly anything so saving money is definite. If you are looking for something that has more of a purpose than just karaoke, this is where your search might end. Hisonic MA222 Karaoke Mixer has a unique player mode which lets you power other speakers at home as well. This can be plugged to your TV so you can have uninterrupted singing time. The controls are simple to use and it has great feature control options that you can play around with to have fun by changing treble, echo or the tone. This will make you feel like a professional. This is a lightweight device and does not have a bulky stature which makes it more portable. Even with so many features on board, the price is pretty moderate. There is a one-year warranty available for the product which will make it a worthy addition. To add some brownie points, it also comes with two free microphones so you don’t have to spend any extra money on them. Now that you have a list with the best available karaoke mixer options, the job of choosing a mixer has become a ton easier. You need to decide your needs and prioritise your requirements and choose the option that suits you best. Once you have your priorities figured including the budget, shortlisting the karaoke mixer becomes easier. All karaoke mixers mentioned above are top of the order devices and choosing any one of these will be a worthy pick. You are not just going to add extra levels of happiness in your life but also to those with whom you are going to be partying with.